Drawing progression. This is my first study of St.John's. Notes about the building, its shading and light are taken. This is the old Saint John's Hospital, last remaining building. It is currently being remodeled as part of a Metro State University expansion. If you drive by it on East 7th Street in Saint Paul, you can see the work being done this summer (2010). I began this project with several sketch studies, and photographs. 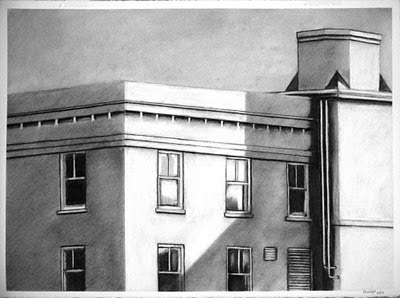 I then moved to a much larger 24 X 30 heavy paper (Arches) and laid out the building skeleton in charcoal pencil. Then I being to block in the shadow and light. After that process was completed I began to add some of the detail on the windows, soffits and fascia. Then I deepened the shadows (it helps to save this process for later, since unwanted smudging can occur if you fill your drawing with too much charcoal while still needing to work on it). After I was mostly finished, I used an pearl eraser to add some highlights, work the sky and add contrast to shaded areas. I cleaned up some of the details and completed the drawing by spraying it with Krylon Fixatif. UPDATE: They've begun tearing down this building. Here is a photo of the demolition underway.